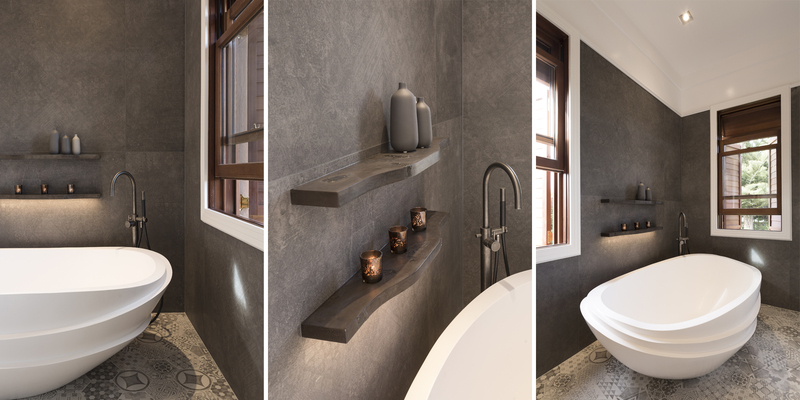 Kitchens By Design | Kitchen Design for Discerning Clients : Italianate Bathroom. 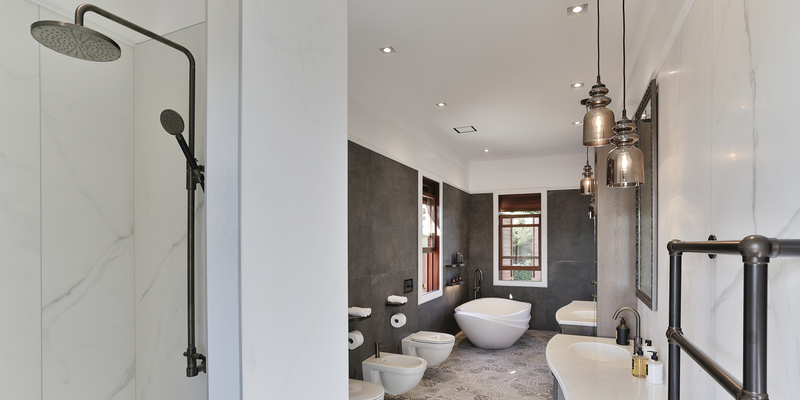 This bathroom was designed as part of a new master suite extension, to match the beautiful Southern Mediterranean architecture of the rest of the home. Symmetry: A tall storage cabinet marks the centre of the room. The vanities, mirrors, pendants, towel warmers spread out from that on each side. Curves: The curved overlay pattern on the vanity fronts is based on the way a wave spreads and pulls back across the beach. 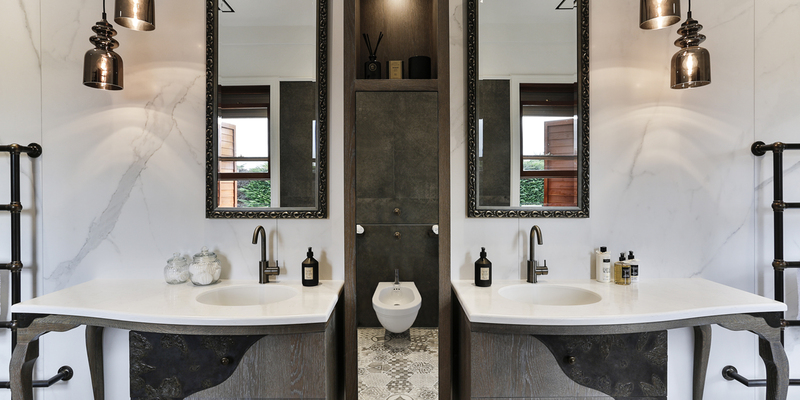 Curves are repeated in the shelves on the opposite wall, the vanity top and legs. The bath was chosen for the beautiful wave-like designs on its sides. 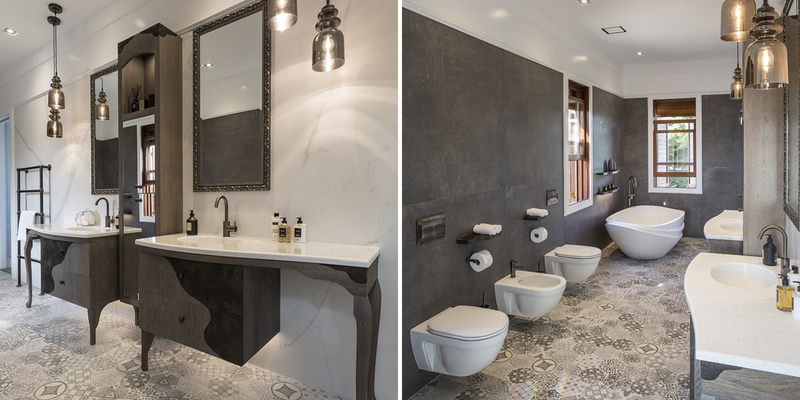 Texture: The varied pallet of finishes include large format Marbletec and Tabor Mood tiles on the wall, striking hexagonal floor tiles, custom furniture-style vanities with metal leaf accents, and aged iron tapware and towel warmers. 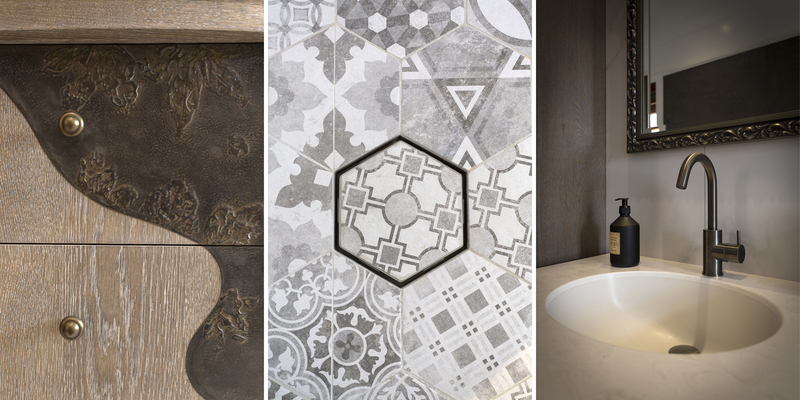 The varied pallet of finishes include large format Marbletec and Tabor Mood tiles on the wall, striking hexagonal floor tiles, custom furniture-style vanities with metal leaf accents, and aged iron tapware and towel warmers.